Every New Year's Eve, I look back at what has happened over the last year and think about what I'd like to see happen in the new year. I'm laughing now because I've just glanced at what I wrote in 2012 and 2013. In those posts, I talk about learning and trying new things... and that is very similar to what I've been thinking about this year too. Too funny. But, perhaps it just goes to show me that those are my ever-present themes in my writing career. But, as much as some things stay the same, it is interesting to see how much has changed in my life in the last few years too. My blogging, despite a few rallying points through the year, wasn't very consistent. I plan to do better this coming year! I have a few topics that I've been mulling over and I think it is time to get them out of my head. Things got more complicated with everyone's lives again this year. So, we didn't meet as much as we have in previous years. I love my crit partners to pieces! But, as things get increasingly hectic, I think I will have to step away from my group for a while. It makes me sad to think about not meeting with them as regularly, but I don't think I have been offering them the value and attention that I feel they deserve. In 2014, I attended When Words Collide, a local writing conference, again! It was a fun weekend full of writing talk! I sat on a few panels and met some great people! This past year I also started working with a writing friend, who received the rights back to most of her back-list. I am excited to help her re-release these in 2015. I expect I'll be talking more about this in 2015. In 2014, I dipped my toes in the publishing waters again. I recognize that I made a few mistakes along the way when I first set out, but now I feel like I have a better handle on the basics and am ready to learn the next steps in this ever-changing world of book publishing. I still read my various industry loops and forums religiously, and love it when I find something new to think about and try. Some of what I learned this year really jump started things for me! And I can't wait to find out what I discover next. Back in 2012, I hadn't published yet. In 2013, I published 2 books. 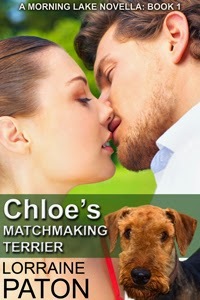 In 2014, I published 1 novelette (Chloe's Matchmaking Terrier) and 1 bundle in my Morning Lake series. I also started to experiment with a pen name (which is still a secret). My pen name now has 6 stories and 2 bundles. I wouldn't normally talk about my pen name on this blog, except that for me it was really about experimenting and taking a chance on something new, which has been a very eye opening and exciting experience for me. Oh - and I now have all three Morning Lake books available in print! Yay! They should all be available at the major online retailers by the end of January! I've just received Dragon Naturally Speaking software, which is a dictation program, for Christmas! Yay! So I hope that will help me get all of the stories out of my head and into a file on my computer. I started "training" it this week, and have been pleased with my preliminary results. I have grand plans for what I'd like to write this coming year, and *fingers crossed* I'll have the time to do it all! I'm excited for 2015! 2014 was a fabulous year for me and I can't wait to build on all that I've learned!